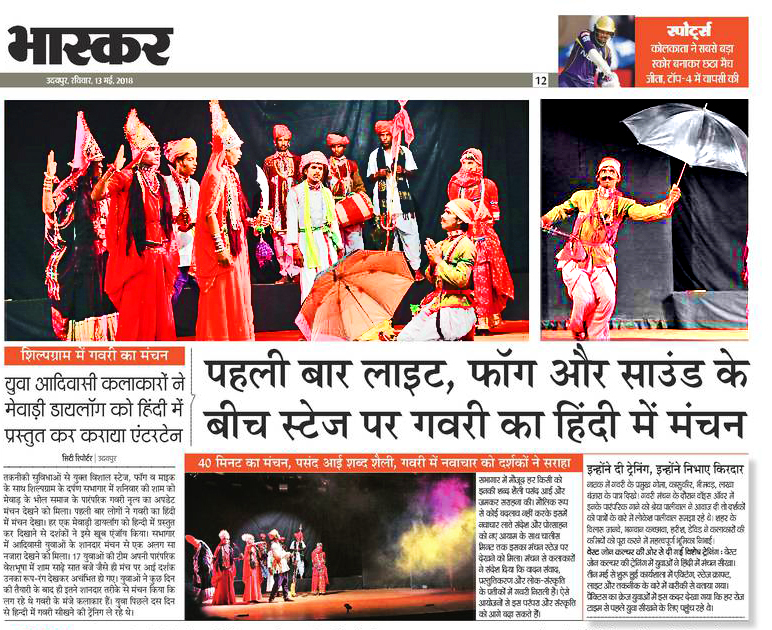 On May 3rd, Udaipur’s West Zone Cultural Centre (WZCC) launched a 10-day “Gavari – From Tradition to Performance” theatre workshop to expose Gavari players to new theatrical skills and their remarkable traditions to a wider audience. WZCC has long supported the ongoing Rediscovering Gavari Project (RGP) to promote this inspiring but endangered indigenous ritual, but this is the first time anyone has attempted to bring a Gavari dance drama to the stage. Dramatist/project coordinator Lokesh Paliwal adapted the classic Bhiyawad story for this presentation based on documentarian Harish Agneya’s extensive research. Their condensed 40-min drama exemplifies Gavari’s ritual artistry and celebrates the primacy of Goddess energy in protecting the social & natural world. Bhiyawad is the name of a demon king who conquered heaven & earth against whom the gods were powerless. The tale relates how Goddess Gavari manifests as 3 beautiful fierce devis who lure Bhiyawad into battle and terminate his evil reign. Sixteen young Jadhol folk artists volunteered to participate and were mentored by mime master & former WZCC program officer, Vilas Janve; ex-TRI program officer Bhagwan Kachaava; and veteran film & stage artist Deepak Dixit. A warm appreciative audience filled Shilpgram’s Darpan Hall on May 12th for the debut presentation; and the young troupe responded with great poetic energy. While Rediscovering Gavari Project supporters are primarily working to raise Gavari awareness among the people, they are also striving to inspire more interest and support from public officials as well. On May 5th, WZCC Director Furqan Khan escorted Raghvendra Singh, Secretary of the Ministry of Culture, to visit Lokesh at a workshop session and receive a copy of the world’s first English Gavari introduction. Together they hope that increasing attention will help preserve Gavari and other threatened intangible heritage treasures.